Into everyone’s life a little rain (sometimes a lot) shall fall. Now, I know that this story is not about me. It is about the people and the little goat who lived it. So, the joy I felt when I first came across it and the sadness I feel today are not really the issue here. 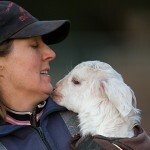 Frostie is a little baby goat who recently came to Edgar’s Mission Farm Sanctuary in quite a desperate state. He had a severe lice infestation and could not properly use his hind legs as the result of a bacterial infection called Joint Navel Ill. He struggled in his determined little way to stand, but to no avail. That is, until he was given the gift of mobility in the form of a little cart that looks somewhat like a sulky. Once strapped in, he was upright, with his little back legs working at gaining purchase with terra firma. His new found freedom allowed him to strengthen his legs and, in time, to walk and cavort unassisted. And boy, did he cavort. There is a sweet video of him frolicking down Kindness Trail with his best friend Pam Ahern (founder of Edgar’s Mission), who loved, supported and helped to care for him during his recovery. Many questions may arise when something like this happens. Certainly the first question asked by all those who loved Frostie would be, “Why couldn’t he stay in our loving family?”. Naysayers may ask what the big deal is. After all, he was just a goat, a very sick little goat. People with compassion for all sentient beings may wonder about the unfairness of it all. And what about how it happened? What exactly is Joint Navel Ill? Well, it is a life threatening condition caused by bacteria entering through the navel or through a cut in the skin shortly after birth. “Predisposing factors include lack of routine dipping of the umbilical cord; poor sanitation in the kidding pens; or does kidding in overcrowded, dirty conditions.” In other words, the conditions in which these beings are forced to live are the root cause of this life threatening illness. One journalist asked me what I wanted from the telling of Frostie’s story and I remember thinking about that for a second and then I said ‘I want for people to be kind to animals and I am sure Frostie would want that too. ← YAY! You Made It! 1)In other words, the conditions in which these beings are forced to live are the root cause of this life threatening illness. ” Raised” becomes” forced to live”. 2)….we all know that the solution is to end the exploitation of nonhuman animals for our own wants. “Raising” becomes “exploitation”. I think this is better. What do you think? I’m so sad to hear this news about Frostie the Snowgoat. I had seen the video made by the sanctuary about Frostie’s strong will to persevere and eventually being able to walk unaided. Pam’s message: I want people to be kind to (ALL) animals is so simple yet so very profound. Yes, I was and still am very sad about Frostie. I am so glad that he did experience much joy and love and freedom in his life under the watchful and healing hands of the people at Edgar’s Mission Farm Sanctuary. This is why I feel that this type of advocacy is important. First and foremost it is about giving the beings who are suffering today, a chance at a better life. It is also about educating the public through videos and stories about the sentience of all living beings like Frostie. It is difficult to remain untouched after viewing the video of Frostie and his determined little way of facing the challenges of life. It makes me more determined to work toward a change for the better-for all these little guys! Btw, I love EDGAR’S Mission ~ Kindness. Would definitely make top of all mission statements I’ve come across! Frostie’s life gives me hope that people will see that we are all animals with needs and emotions and, as such, have value. I have a friend who says that as humans, we hold the stewardship of this earth and that we have a responsibility to protect those who cannot advocate for themselves. I, too, am a big fan of Edgar’s Mission and the work they do protecting the innocent. I had a lovely e-mail from Pam thanking me for the tribute I wrote for Frostie. This is very telling about who she is and why she does what she does. What a lovely story and tribute to Frosty the snow goat. His life highlights the problem of humans enslaving animals for their own wants, not needs. I am so glad that Frosty got to experience love and kindness from Edgar’s Mission during his short life. I like your comment above about humans being stewards of this earth and should therefore be guardians of the voiceless. This is how I feel exactly. It takes nothing away from a human to be kind to an animal. All lives matter and Frosty certainly showed a vigour and joy for his life despite all his problems. Rest in peace little soul! Glad that you connected with Frostie and the story of his life after finding love at Edgar’s Mission. I was greatly impacted by his love of life, as well as by his struggles and I think of him to this day, I wish to this day that there had been a better outcome for him and for all those who advocated and cared for him at Edgar’s Mission.